Whether it's late night, mid morning or before dinner, we all get those food cravings that must be satisfied quickly. This week, the #SundaySupper crew is sharing recipes to satisfy those "year end cravings". Hosted by Cindy of Cindy's Recipes and Writings, this week's collection of recipes are fitting for the last Sunday of the year. What is it that you really want to indulge before the year is out and the healthy resolutions begin? What culinary foolishness will you deign to tolerate but will not soon forget? That's right. 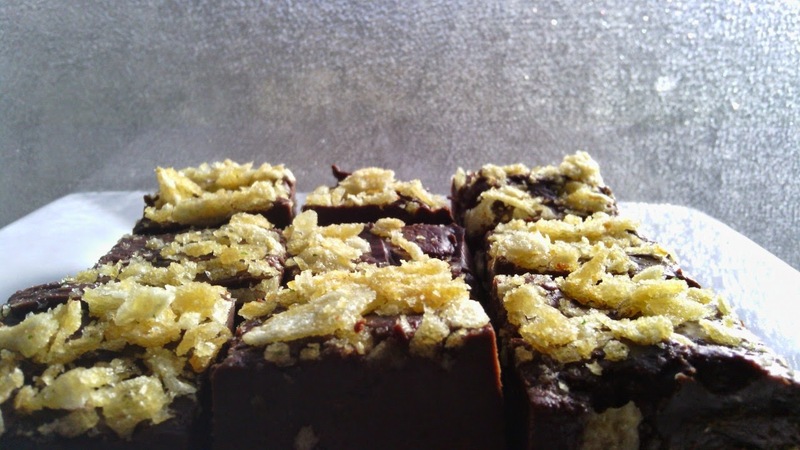 Dark chocolate potato chip fudge. 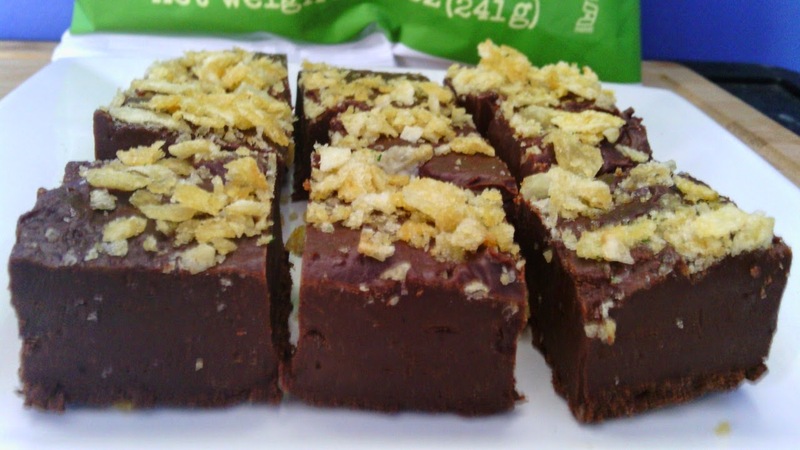 Fudge with potato chips on top. Not only did I use potato chips on mine, I used kettle-style chips. Jalapeno kettle chips. I know. I'm crazy. I'm also the lady who put dill pickle chips on her red velvet cupcake (that one time where there were no witnesses or photographic proof). I know. I'm weird, too. I'm also completely obsessed with this particular brand and style of chips right now and I can't stop eating them. This fudge will not help my cravings at all. As soon as I'm done with this post, I'm headed to the grocery to get 2 more bags. I'm not the first person to come up with this idea, but it's the best of both worlds: sweet, creamy chocolate paired with salty, spicy, crunchy chips. I've satisfied a whole population of people in one fell swoop. I've seen fudge recipes where the chips were stirred in. I've seen recipes with caramel added. I've also seen chocolate-dipped chips for sale and on other blogs. I applaud those wonderful things, but I'm in love with this fudge. Oh, yes. I am. I used 66% dark chocolate which is as dark as most can stand without creeping into weird unsweetened baking chocolate territory. You can use 60% or less cacao and the results will still be the same. For recipes and inspiration to whet your craving's appetite, please check out what the rest of the Sunday Supper crew is sharing on this last Sunday of the year! Line the bottom and edges of a baking pan with aluminum foil or parchment paper. In a medium-sized saucepan, stir together chocolate chips and condensed milk over medium-low heat until the mixture is combined and the chocolate is completely melted. Stir often with a high-heat rubber spatula, so the bottom doesn't stick and burn. Remove the pot from the heat and stir in the vanilla until combined. Alternatively, microwave the condensed milk and chocolate in a heat-safe measuring cup on 30-40 second intervals, stirring and mixing between each interval until it is completely melted and smooth. Total time: 2:30 in the microwave. Immediately spread the mixture evenly into the prepared baking pan, and then press the crumbled kettle chips into the surface of the fudge. Refrigerate for at least 1 hour, until the fudge is firm. To cut: Simply lift up the foil or parchment paper out of the pan and transfer the fudge to a work surface. 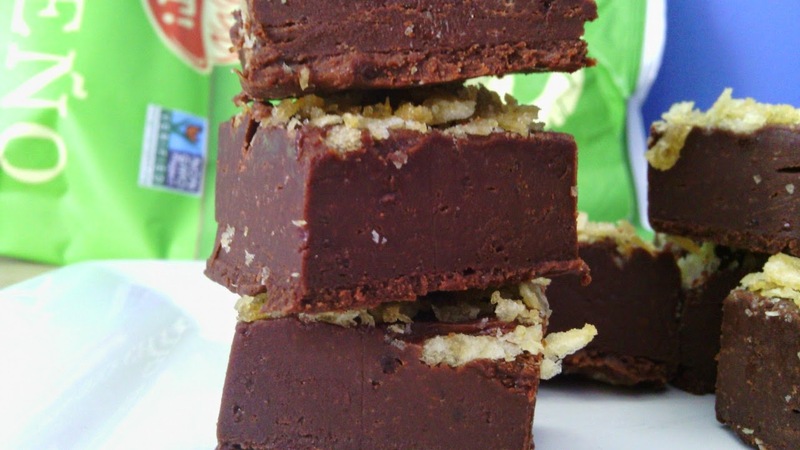 Peel off the foil or parchment, and use a large knife heated with hot water to slice the fudge into square pieces. This fudge is best on day one, but store it in an airtight container for up to 5 days for optimal freshness. 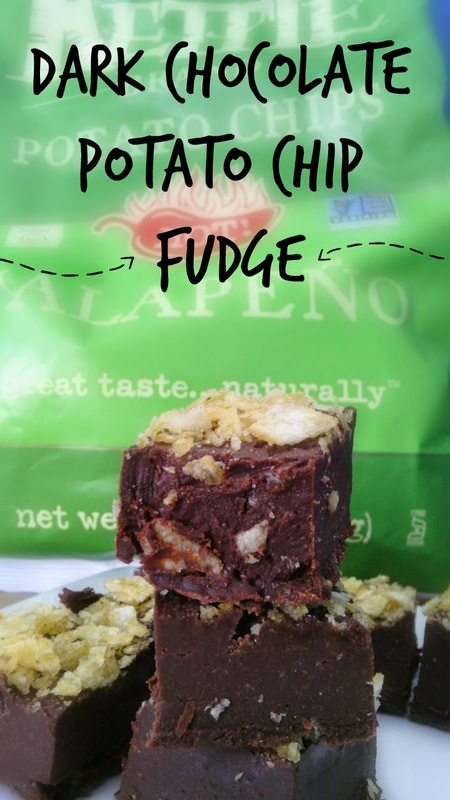 Jalapeno Kettle chips definitely sound perfect for this fudge! Now that is a way to spice up fudge for sure! I am a huge fan of sweet and salty and spicing these up sounds awesome! Oh, yes, Kettle Jalapeno chips are the bomb! Love them in this fudge! This is the most creative fudge ever! I love it! Sweet, Salty & Spicy in one bite! Awesome! Who wouldn't be craving this fantastic combination of flavors? I love this. Most of the time my cravings are confused and can't decide if they want sweet or salty, but you gave us both! Genius! The ultimate crave-wothy combo! Yummy! I love the sweet - salty combo, and then you added the jalapeño kick. Absolutely perfect!! !!! Is there any left?? I'll take a pound of it! I love this! I have been thinking of doing potato chips in fudge for awhile now, but thus far the closest I've come is pretzels. Which is fantastic! I'd love to try your recipe sometime!